Your secrets are safe with me. Interesting info, thank you. I was having a tough time finding sellers for runoffgroove schematic kits. I guess I see why now, with Chinese sellers offering them for next to nothing. This is true about the market selling ready-made units so cheap, but not all of the particular effects are made. I like building my own too. 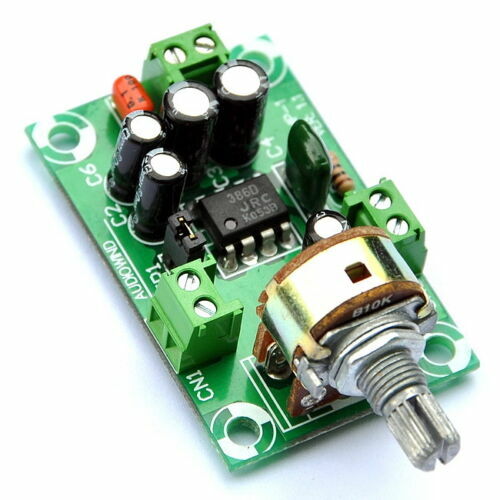 You can easily tweak your own build on a build board or breadboad more so than a ready-made unit because the PCB is made just for that particular version. The last time I got individual 386 chips of the N1 type they didn't last long and I had to replace mine with the more durable N3 type. The N1 - N2 - N3 chips are made to handle 9volts to 12 volts DC, but the N4 type is made for higher voltage 12 volt to 18 volt DC. I also get mine from Mouser or Small Bear when they have them. Best chips are the Texas Instrument in my mind. But JR (JapanRadio) I think are the designers. If you not gonna buy a Gitty amp Look for one of these. they$ 10 on ebay you can find them $4. You can find the kits for a little over a dollar, they work ok considering they are a 1/4 watt, but the mods are easy to add as you can swap out the components before soldering. A good and cheap way to develop some soldering skills too. Internet data on these 9volt amps have been all over the place on output wattage. Some say 1/4watt, some 1/2 watt and some 1watt. I know that the voltage used can play a part in that, these little amps say to use 9volts and up to 12volts. All three are right. I think it is dash 1, 2, and 3 to designate the wattage. All the really cheap ones I have seen are the lowest output. Someday I will make a full watt screamer! If you do make one, use the 386 N3 chip, it's a heavy duty chip. The N1's seem to be too cheap. The Ruby amp is like the Smokey or Lil'Gem amps, but uses a nice Jfet filter circuit in front of the chip and sounds a lot like a Fender Champ. I added a 2-way switch for the caps to have the regular .047 cap on one side and a .1 cap on the other for Fender Bassman type tones. It doesn't really get Bassman tones, but it is darker. I found the low watt chips at 9 vdc have the best distortion tones. The one watt chip running at 12 vdc has more clean headroom. That has been the same outcome for me too.